Explore the hills and winding streets in the eclectic city of Valparaiso. Visit the cosmopolitan beach side town of Vina del Mar. 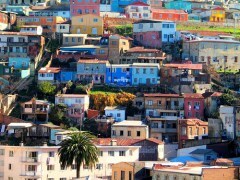 If you have extra time then why not enjoy an overnight winery stay or an overnight in colourful Valparaiso. Experience the wonders of Chile’s north with a visit to the spectacular Atacama desert. Add a stopover in the spectacular Lakes District of Chile and Argentina. On arrival at Santiago airport you will be met by our representative and transferred to your centrally located hotel. 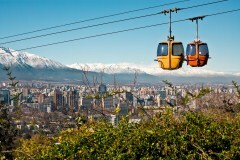 After check in to your hotel, the remainder of the day is at your leisure to explore the Chilean capital. Today we will head over to the coast and explore one of the most fascinating cities in Chile; Valparaiso. ‘Valpo’, as it is fondly known by locals, was declared a world heritage site by UNESCO, and it is not difficult to see why. Picturesque architecture and multi-coloured urban housing spread out over more than forty hills, creating one of world’s most eclectic, unique cities. We will visit the downtown area with its new government house, the Plaza Sotomayor, the Plaza Victoria, the cathedral and the harbour area. Afterwards we take a funicular up into the hills where there is a fantastic collection of brightly painted houses and a fantastic view over the city. We enjoy coffee in one of the many cosy restaurants before we enjoy a stroll through the labyrinth of colourful streets lined with impressive street-art. You can also visit the former home of Pablo Neruda (entrance fee not included) and learn a little more about this famous Chilean poet. From Valparaiso we’ll head to the fashionable coastal resort city of Viña del Mar where we can admire the famous city ‘flower clock’ and visit the Main Square, which offers an amphitheatre that hosts the Viña del Mar International Song Festival every summer. We include time for lunch and on the way back to Santiago we will explore the Casablanca valley with its famous orchards, citrus groves, grape plantations and wonderful mountain backdrops. For those interested in tasting some of the local produce a visit to a local vineyard can be arranged. We return you back to your hotel in Santiago where you have the evening at your leisure. Hotel rates are based on double/twin share lead in rooms. Other room types and hotels are available. Rates are subject to change and different rates may apply during holiday seasons and special events.